23 December 1996: This series of four images shows the appearance of Comet Hale Bopp in early November 1996. At this time it was approaching the Sun in the sky, and these images are some of the last made by a major astronomical telescope in 1996. They were made by Hermann Boehnhardt of the Astronomical Institute of the Ludwig-Maximilian-University in Munich (Germany). 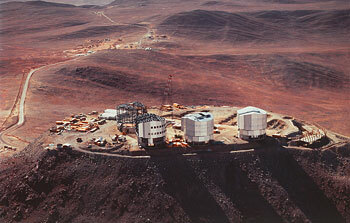 23 December 1996: These aerial photos, obtained on December 8, 1996, show the rapid construction progress at the site of the VLT Observatory on Cerro Paranal. 28 November 1996: According to the widely accepted Big Bang theory, the first galaxies formed by gravitational accretion from slight irregularities in a primordial sea of matter, a process that required considerable time. Hence it would be expected that there would be a delay between the Big Bang and the appearance of the first galaxies. Or, looking back in time from the present, we would expect to find an epoch in the distant past when galaxies had not yet come into being. Astronomy On-Line Programme Enters "Hot Week"
13 November 1996: The Astronomy On-line Programme began officially on 1 October and is now about to enter its most intense phase, known as the Hot Week . On 18 - 22 November, an estimated 4000 astronomy-interested, mostly young people in Europe and on four other continents will get together during five days in what - not unexpected - has become the world's biggest astronomy event ever organised on the World Wide Web. 28 October 1996: The construction of the largest optical telescope in the world, the ESO Very Large Telescope (VLT) , continues at full speed, aiming at first-light towards the end of 1997. There is hectic activity on all fronts, both at the Paranal Observatory in Chile and at the many involved industrial firms in Europe. 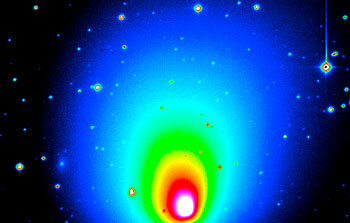 20 September 1996: This heavily processed image of C/1995 O1 (Hale-Bopp) is based on a CCD frame that was obtained on August 18, 1996, by Nick Thomas (Max-Planck-Institut fuer Aeronomie, Germany) and Heike Rauer (Observatoire de Paris, France), observing with the DFOSC multi-mode instrument on the Danish 1.54-m telescope at La Silla. 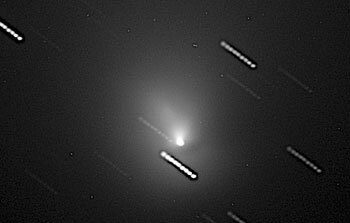 The frame was taken at 04:20 UT through an R filter (to show the dust around the cometary nucleus) and the integration time was 20 s.
16 September 1996: On August 7, 1996, Eric W. Elst (Royal Observatory, Uccle, Belgium) reported his discovery of a cometary image on mid-July exposures by Guido Pizarro with the 1.0-m ESO Schmidt telescope at the La Silla Observatory. Further ESO Schmidt plates were then obtained, and on August 19, with the help of orbital computations by Brian Marsden (IAU Central Bureau for Astronomical Telegrams, Cambridge, Mass., USA), Elst was able to identify the object on them. 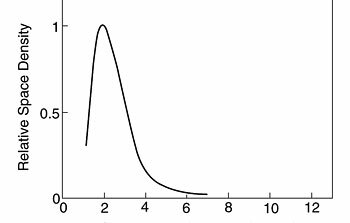 Even though the orbit (Period = 5.6 years; inclination = 1.4 deg; eccentricity = 0.17) is entirely characteristic of that of a main-belt minor planet with the implied long-term orbital stability, the continued presence of a tail seemingly confirms the object as a 'comet'. 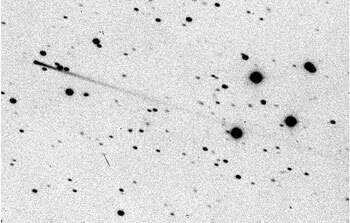 The object now carries the designation 'Comet P/1996 N2 (Elst-Pizarro)'. 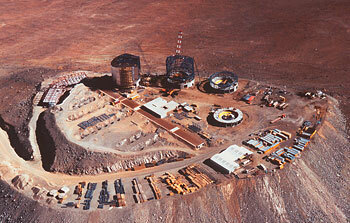 5 September 1996: On 5 September 1996, the Senate of the Republic of Chile (Second Chamber of the Parliament) has ratified the Interpretative, Supplementary and Modifying Agreement to the Convention of 1963, which regulates the relations between the European Southern Observatory and its host country, the Republic of Chile. 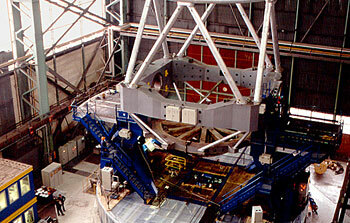 14 August 1996: ISAAC (Infrared Spectrograph And Array Camera) will be the first major instrument to be installed at VLT Unit Telescope no. 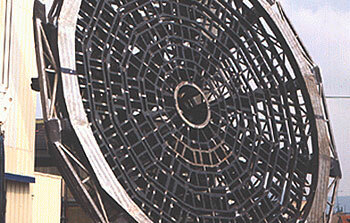 1; according to the current planning, this will happen by mid-1998. 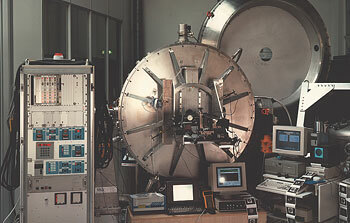 ESO Press Photo eso9635a shows this complex instrument during the present, thorough technical tests in the Infrared Laboratory at the ESO Headquarters in Garching (Germany). 2 August 1996: The past four centuries have seen dramatic improvements in astronomical equipment, in terms of better and larger telescopes, more accurate and sensitive detectors and, not the least, by advanced space instruments with access to new spectral regions. However, until recently there has been little progress on another equally important front, that of quantifying the unavoidable influence of this equipment on the astronomical data they produce. For a long time, astronomers have desired to remove efficiently these `instrumental effects' from their data, in order to give them a clearer understanding of the objects in the Universe and their properties. But it is only now that this fundamental problem can finally be tackled efficiently, with the advent of digital imaging techniques and powerful computers. 1 August 1996: The Local Group of Galaxies consists of a few large spiral galaxies - for instance the Milky Way galaxy in which we live, and the Andromeda galaxy that is visible to the unaided eye in the northern constellation of the same name - as well as two dozen much smaller galaxies of mostly irregular shape. Whereas the larger galaxies have extended halos of very old stars, no such halos have ever been seen around the smaller ones. 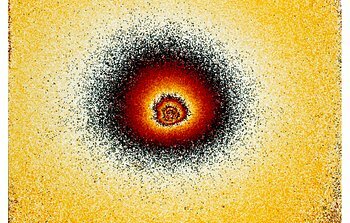 Now, however, Dante Minniti and Albert Zijlstra , working at the ESO 3.5-metre New Technology Telescope (NTT), have found a large halo of old and metal-poor stars around one of the dwarf galaxies in the Local Group. This finding is quite unexpected. It revises our understanding of star formation in these galaxies and provides important information about the past evolution of galaxies . 25 July 1996: Each of the giant Zerodur mirrors for the four unit telescopes of the ESO Very Large Telescope (VLT) , with a diameter of 8.2-metres and a total area of more than 50 square metres, will be supported by a complex steel structure, referred to as the M1 Cell . 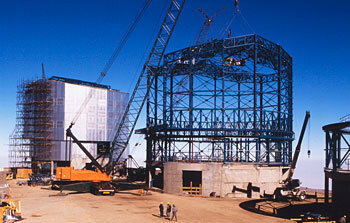 This structure will also support the M3 Tower that protrudes from the central hole of the mirror and carries a flat mirror (M3) that serves to reflect the light towards the Nasmyth platforms on either side of the telescope. On these platforms are placed the heavy instruments that will record the light from celestial objects collected by the telescope. 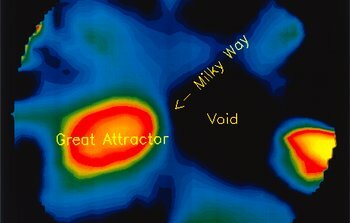 25 July 1996: Using telescopes in Chile, Europe, Australia and the USA, an international team of astronomers  has discovered large empty regions ('holes') in what they refer to as the 'local Universe'. These regions, as well as others with excess mass density are revealed by a study of the motions in space of more than 2000 galaxies. They are among the largest structures ever seen in the Universe and have diameters of up to 100 million light years. 18 June 1996: Astronomy On-Line is a major, all-European project that will take place in conjunction with the 4th European Week for Scientific and Technological Culture later this year. It is based on intensive use of the World-Wide-Web (WWW) and represents the first large-scale attempt in the world to bring together pupils and their teachers all over one continent to explore challenging scientific questions, using modern communication tools, both for obtaining and for communicating information. 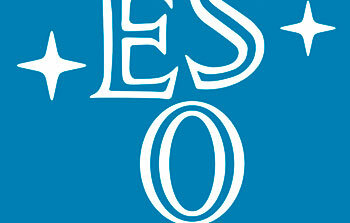 24 May 1996: The programme will be carried out in a collaboration between the European Association for Astronomy Education (EAAE)  and the European Southern Observatory, and together with the European Commission (EC). 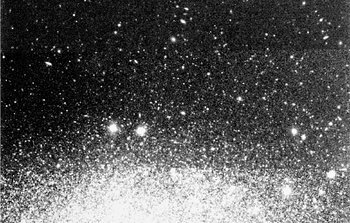 20 May 1996: Observations of Comet 1995 O1 (Hale-Bopp) continued at ESO during the period of May 10 - 14, 1996, with the MPI/ESO 2.2-m telescope and the multimode EFOSC II instrument. Both direct images and spectra were obtained. 20 May 1996: The active phase of Astronomy On-Line will start on October 1 and reach a climax on November 18 - 22, 1996. A new and unknown comet was discovered by Robert Evans on a photographic plate, obtained by M. J. Drinkwater on May 10, 1996, with the UK Schmidt telescope at Siding Spring Australia. 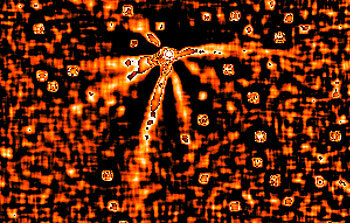 More observations were made within the next days and the comet was soon given the designation 'Comet 1996 J1' (i.e. the first comet to be found in the period May 1 - 15, 1996). Following astronomical tradition, it was also named after the discoverers. 18 April 1996: On April 12, two observers in Australia and Japan independently reported the sudden appearance of a supernova in the southern elliptical galaxy NGC 5061, a prominent object in the Centaurus constellation (IAUC 6380). The magnitude was about 13 (visual) and the exact position was measured as R.A. = 13h 18m 01.13s, Decl. = -26d 50m 45.3s (equinox 2000.0), or about 52 arcsec west and 31 arcsec south of the galaxy's center. 22 March 1996: A series of CCD frames, showing the inner coma of Comet Hale-Bopp, was obtained with the SUSI high angular resolution camera at the ESO 3.5-metre New Technology Telescope (NTT) under very good seeing conditions in the morning of March 20, 1996.